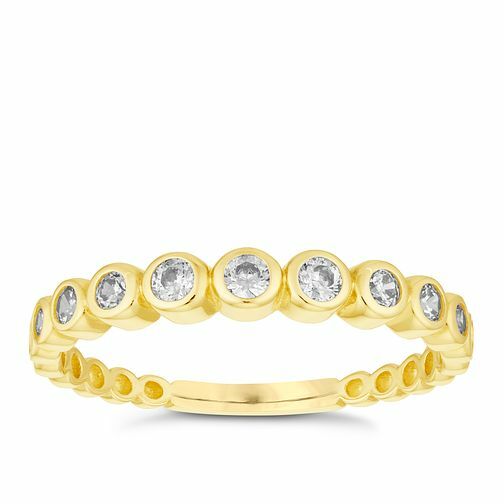 Set with dazzling cubic zirconia in an eternity style, this charming ring is crafted in 9ct yellow gold for a contemporary feel. 9ct Yellow Gold Round Cubic Zirconia Ring is rated 5.0 out of 5 by 2. Rated 5 out of 5 by Anonymous from Very pretty ring The cubic zirconia and gold ring is extremely pretty; very classy and tasteful; it is very delicate but stacks really well with my wedding and engagement rings. I was delighted with it. Rated 5 out of 5 by Anonymous from this ring looks great The ring looks great on the finger and fits perfectly, it compliments other rings beautifully.